In Lewis Allen's decidedly queer Technicolor noir Desert Fury, Lizabeth's Scott's Paula Haller quits school and returns home to the "cactus graveyard" of Chuckawalla, Nevada where her mother Fitzi (Mary Astor) rules the roost. Fitzi runs The Purple Sage, the town's premier roulette joint, which has just attracted an unwelcome visit from spivy gambler Eddie Bendix (John Hodiak) and his overly protective right-hand man Johnny (Wendell Corey). Despite her outward independence, Paula is naive and directionless, unsure what the future holds. 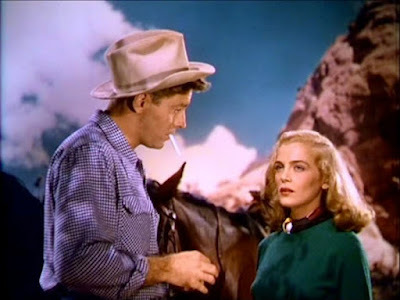 The only attraction this second-tier mining town has to offer is square-jawed traffic cop Tom Hanson (Burt Lancaster), a "broken down cowboy" like Gay Langland in The Misfits (1961), no longer able to ride the rodeo but who shares Paula's love of the open range and hopes to retire to a ranch. Tom is Fitzi's preferred candidate for Paula's hand, but the girl resists. She's taken a shine to bad boy Bendix and won't be talked out of it. Disaster beckons. Desert Fury marries the big skies of John Ford's great Westerns with Sirkian melodrama. Taken from a serialised novel by Ramona Stewart, the script by Robert Rossen and an uncredited A.L. Bezzerides is more interested in the emotional lives of its pulp protagonists than Eddie and Johnny's gangster ploys or Fitzi's criminal past. While the ostensible plot is as old as time - an innocent must choose between two suitors, picks the rotten egg and comes to rue her mistake before order is restored - Desert Fury's real concerns are the rocky relations between Fitzi and her mother and Eddie and Johnny. Fitzi loves her daughter dearly. She has framed keepsakes of Paula scattered across her office and allows her every freedom, never begrudging her spending money or allowing her to go without. Fitzi has had a hard life and grafted for a living on both sides of the law, hardening in the process. She envisions a better future for her progeny, hence her mortification when Paula becomes involved with Eddie. Paula's is a natural reaction against her parent's controlling influence and the women otherwise behave like bickering sisters. Or even lovers, kissing passionately on the lips at the film's denouement. 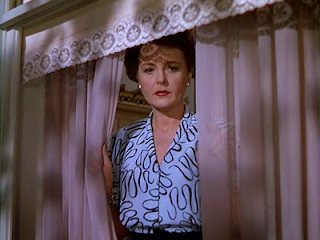 With lines like that, Desert Fury was always doomed to remain a camp curiosity, a cult oddity rather than a truly top notch noir despite its fine cast, genuinely glorious Technicolor cinematography from Charles Lang and Miklós Rózsa score.